Get more use of your spreadsheets with Power Tools. 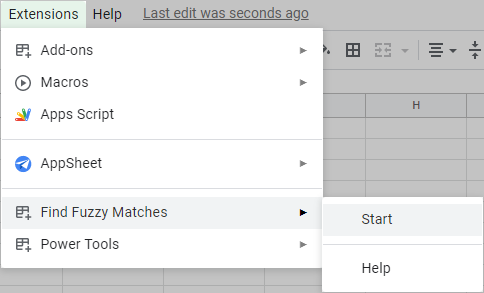 This collection of 20+ professional add-ons for Google Sheets will help you accomplish many tasks effortlessly. 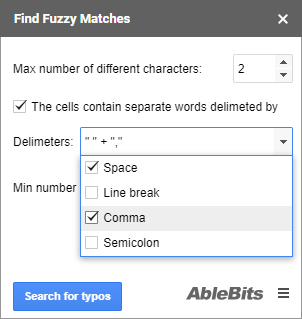 Find Fuzzy Matches is a smart tool that will help you group and correct all typos you have in your Google spreadsheet. First, select the column with records that may contain typos. Tip. 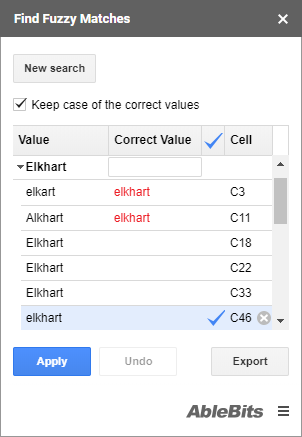 You can change the range for the search any time before you click Search for typos. 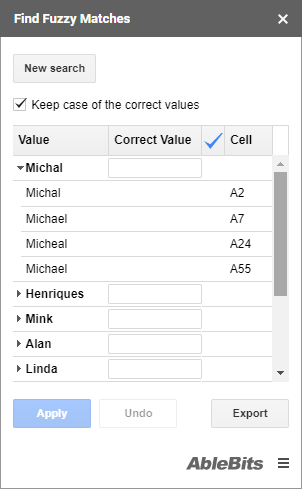 Simply select the necessary cells in your sheet. 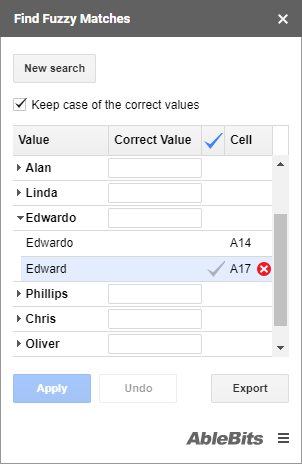 Use the Max number of different characters field to choose how many characters can differ in your records and to narrow down your results. Tip. 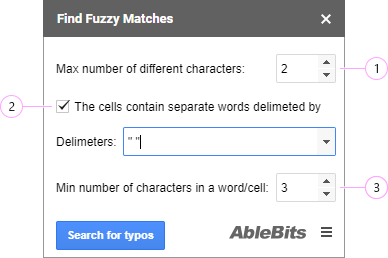 The fewer characters you enter, the more exact search results you will get. If you're searching in columns that contain several words in one cell, e.g. street address and city, you can look at each word individually by ticking off The cells contain separate words delimited by. 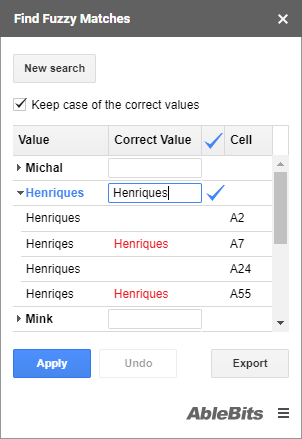 To exclude short words from the search, set the Min number of characters in a word/cell. This will make the add-on search only in words that are at least this long. 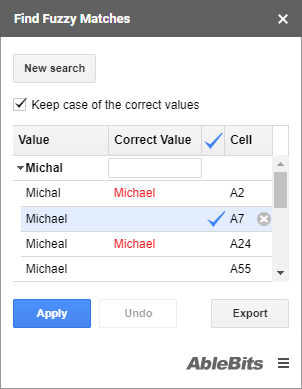 When everything's set and you're ready, click Search for typos to work with the results. Tip. You can also click on the check mark in the Action column to apply the entered word as correct. If you notice any errors before you close the add-on, you can revert back to the work mode by clicking the Undo button. The add-on will keep all your changes, so you could quickly correct any mistakes. If you want to keep the search results for a record or take a closer look, you can export them to a new sheet by clicking on the Export button at the bottom of the sidebar. 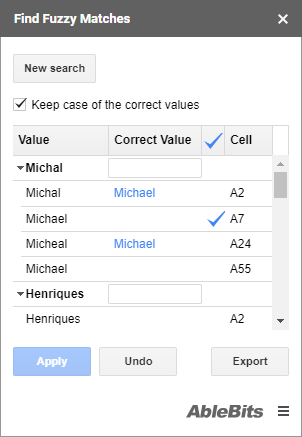 To run a new lookup with other search settings, click the New search button at the very top of the add-on.